More and more wine producers are relying on new technologies to remove alcohol or pump in oxygen. Wine editor Lettie Teague goes tasting in an industrial park. Anyone who's seen Joan Rivers's face can probably answer the question "How much is too much?" when the topic is plastic surgery. But when it comes to a manipulated wineone to which sugar or oxygen has been added or alcohol has been removedit's easier to find a consensus about the perils of multiple face-lifts than it is the effects of microbullage. Microbullage, or "tiny bubbles" (no relation to the Lawrence Welk tune), is a method of adding oxygen to wine, softening its tannins and making it easier to drink. Developed by a Frenchman named Patrick Ducournau in the early 1990s, it's one of several new technologies used more and more frequently by winemakers all over the world. 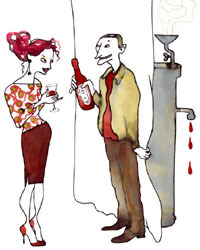 Yet, as the popularity of such methods has grown, so has the number of producers who question their use, suggesting they create unnatural or even inferior wines. Not that wine hasn't been manipulated for hundreds of years. Perhaps the most infamous manipulation took place in 1985, when some Austrian producers added antifreeze to their wines to sweeten them. Othernonlethalmethods include adding sugar (chaptalization) to boost alcohol levels in rainy years or acid in years that are too hot, or employing "designer yeasts" to impart specific aromas and flavors. Pro-machine producers argue that these methods are no less manipulative than microbullage. To better understand the new technologies (and, hopefully, taste some manipulated wines), I headed to Sonoma. My first stop was ConeTech, home of the Spinning Cone Column, a machine used to remove alcohol from wine. With its headquarters in a drab Santa Rosa office park, ConeTech looked more nondescript than it did nefarious. Scott Burr, ConeTech's vice president of operations, had offered to give me a tour and a tasting, provided I didn't insist on getting client names, though among the 800 or so, Burr claimed there were quite a few famous ones. "Some of the best-known Pinot Noirs out there have come through our doors," he said. Burr has been at ConeTech for nearly 13 years, joining soon after his college graduation and a few years after the export of the spinning cone from Australia to the States. Initially, the cone was used by food manufacturers to manipulate things like tannin levels in tea. It wasn't until the early '90s that the technology was used for wine. What grape did he work with most often? I asked, thinking Burr would probably answer Zinfandel, the notoriously high-alcohol grape. But Burr told me that he worked with Pinot more frequently, explaining that winemakers often wait a long time for this grape to get ripe, resulting in high alcohol levels. Burr led me into a large space with extra-large tanks. "Please don't read the client names on the tanks," he requested politelythough he kept me so far away there was no way I could. The spinning cone was operated by a box that looked like a vending machine and said Flavourtech on the front.The cone looked like a tall tank. Just then two men carrying jugs walked past us. "That's the flavor going by," said Burr. What if the men tripped and spilled it? Would they substitute another wine's flavor? Of course not, Burr replied, sounding indignant. For our tasting, Burr brought out samples of a Sonoma Chardonnay that had been de-alcoholized to various levels: 14.4 percent, 12.8 percent and 8.5 percent. The 14.4 was the wine "in its purest form." It burned the back of my throat. The 12.8 had a small amount of de-alcoholized wine added into the blend, and it tasted diluted. The 8.5 had no flavor at all. Next was a sample Syrah, de-alcoholized to three levels: 14.3 percent, 13 percent and 8.5 percent. Where was it from? "I can give you an approximate geography," Burr replied: "California." When I pressed him to be more specific, he added, "A little Sonoma, a little Lodi." That narrowed it down by a hundred thousand acres or so. Was this enology or espionage Burr was practicing? The 14.3 Syrah had harsh tannins and little flavor, while the 13 had some sweet blackberry notes and softer tanninsthe first de-alcoholized wine I could imagine wanting to drink. The 8.5 had no taste at all. "It needs work," admitted Burr. Though Burr was a genial, if secretive, fellow, he hadn't convinced me of the merits of the new technology. I hoped Vinovation would offer stronger evidence. If ConeTech's look was anonymous office park, Vinovation's was back-alley industriala giant warehouse on a dead-end street in Sebastopol. It reminded me of something Burr had said: "There's romance with wine but not with winemaking." Vinovation specializes in several types of machinery, including reverse osmosis, or RO, and micro-oxygenation (microx), a.k.a. microbullage. I'd met Clark Smith, Vinovation's founder, in New York a few weeks before. An erudite MIT dropout, he'd held a dinner to talk about the potential of technology to make extraordinary wine. "I want to create an opera in a bottle," he had said (though I didn't taste anything like Turandot that night). I found him in a small, cluttered office, trying to start his computer. I needed to see a PowerPointpresentation, he said. This was crucial to understanding his work. After an hour or so of reading over his shoulder, I asked Smith if we could taste wines instead. He switched off his laptop and gave me a glass of undrinkable "85-percent alcohol distillate" (my punishment for not seeing the whole presentation?). Next he offered a German Riesling and several Syrahs of varying levels of alcohol and tannins. The tannins he compared to types of sandpaper, which he insisted I hold. "I want to prove to you that wine is fundamentally mysterious," he saidthough proving that mostly about himself. Smith led me to a series of machines, one of which had steel chips that Smith called "rice chex." These helped in the process of separating the alcohol from the wine. A man monitored the machine from a desk. "This isn't a winemaking tool; it's a grape-growing tool," Smith declared with a sweep of his armmarking the first time I'd heard a machine and a desk called a vineyard device. Smith showed me other machines, including an "ultra filter," which resembled a tuba. "That's for heavy-press Pinot. It filters out the tannin," he said. There weren't, however, any Pinots for me to try. Perhaps, I suggested, I'd understand the machines better if I saw them in an actual winery. Would any of Smith's thousand or soclients give me a tour? Michael Havens of Havens Wine Cellars would, replied Smith: "He taught me everything I know." Havens is a respected winemaker in Napa who has a particular gift for Merlot. He'd been using microx since 1996 and even traveled to France to learn more about it from Patrick Ducournau. According to Havens, there are more than 1,200 microx machines in France, and their use is "standard operating procedure on the Right Bank and among all the First Growths," he said. I found Havens remarkably straightforward (and blessedly metaphor-free). He suggested we barrel-taste Merlotssome treated with microx, some not. Wasn't the technique, I asked delicately, a way to make a difficult wine taste good? Havens shook his head. "You can't make a silk purse from a sow's ear," he declared. Then he opened a 1999 Bourriquot, a Cabernet Franc-Merlot blend that Robert M. Parker, Jr., called "one of the most aromatically complex wines in Northern California." A microx product. "If only winemakers opposed to the process could taste this," I said, marveling at its deep flavor and rich texture. Havens nodded and said, "Purity is a good goal, but I think good wine is an even better goal." Perhaps if more winemakers were as open as Havens is about using microx and other technologies, these manipulations might be better accepted, or at least understood. A few producers have been as forthright: Ridge Vineyards, for example, notes on the label that its 2002 Spring Mountain Zinfandel went through reverse osmosis and even reveals the level of de-alcoholized wine. But for now, it's still easier to find an admitted user of botox than it is to find an avowed maker of "enhanced" wine.